I'd roll with cht. I'm putting him in too. 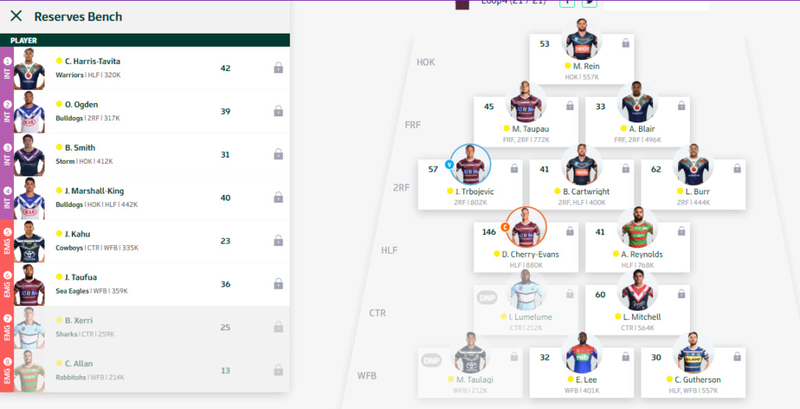 I've got Xerri v roosters or Sele on the bench to choose from. If I have D.Brown at 17, Garner at 18, CHT at 19, I should get Garner's score correct? @Spuddies wrote: If I have D.Brown at 17, Garner at 18, CHT at 19, I should get Garner's score correct? Yes, you are all set. I was going to use Okunbor and loop Bird/CHT but couldn't bring myself to do it. Bird stayed in the centres and the loop is CHT or Sivo/Okunbor now... still not 100% between those two. Sivo slightly higher ceiling? @Ponga Yeo the Mann wrote: Burns at 17 and brown in the halves and then.. If Carty plays first, you can't swap his position after he's played. If Carty plays well, you leave as is. If you think Rav will score higher then you swap Rav/Burns after Carty plays. Lawrie plays so late in the round that you can't really do anything after seeing his score, you have to make the call to get his score or not before seeing him play. You can swap him with Rava or CHT but you'll have to make that call before seeing them play. Thanks @filthridden and @Milchy ! Would I get the highest score out of the two players or would I get the score of the player who plays first. You would get CHT because he is ranked highest. The score they get or the order they play in is irrelevant. There is a test currently underway to confirm how it handles DDP's, but in your example you get CHT. It goes down your list of ressies and picks the first half. Here are 2 loops I tried last round. There must be some smarts involved about picking who subs in. Only relevant difference was position of 2nd AE , so that must be a factor, unless someone has any other great ideas to test. I should have known that Milchy would be all over this, and saved myself some effort. Here's the results for my test as well, which seem to align with those above. All three red-dots were covered by Elgey substituting into HLF, Peachey going into CTR and Gutho going into WFB. This result aligns with theory 4 from my previous post in this thread, and would seem to put a line through the other three theories I proposed. I'll still continue with this for the next few weeks however, just to make sure. PS. This pretty crappy team managed to score 766 points (766 points overall) and jumped to ~ 87000 overall out of ~ 98000 teams. I'm not sure how many teams joined the comp this round but surely it can't be 10000. 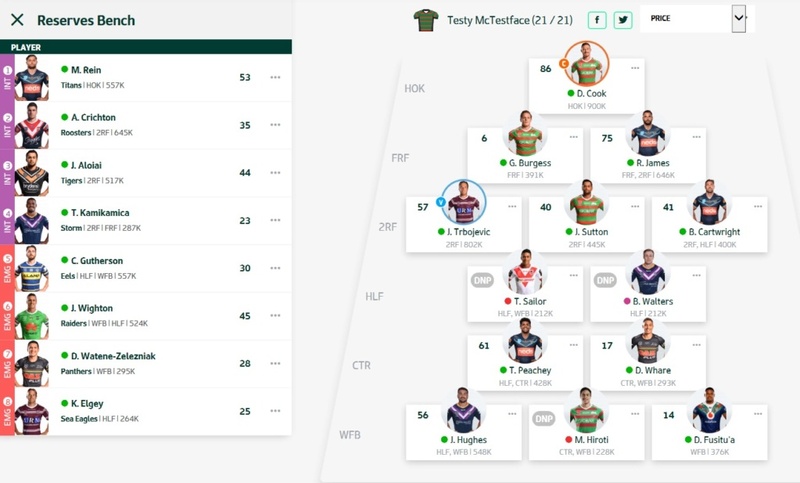 There must be a buttload of incomplete teams or teams that are full of Maloney's and Carter's. Gutherson should sub into HLF. Wighton should sub into HLF. Watene-Zelezniak should sub into WFB. Gutherson should sub into WFB. Wighton should sub into HLF. Elgey should sub into HLF. Gutherson should sub into HLF. Wighton should sub into WFB. Elgey should sub into HLF. Okay I think I need one more lesson on setting my team up. Set your bench up with players who play late. And then looping..
Best way to set this team up? Thanks in advance lads! Hopefully I’ll have it down pat after his! @Ponga Yeo the Mann wrote: Okay I think I need one more lesson on setting my team up. Timing of C and VC doesnt really matter, only advantage of being early like first game, is you can guarantee they will be playing. The important timing is ideally your players you want to loop in, should play as early as possible, so you get to see their scores before deciding which score to take. 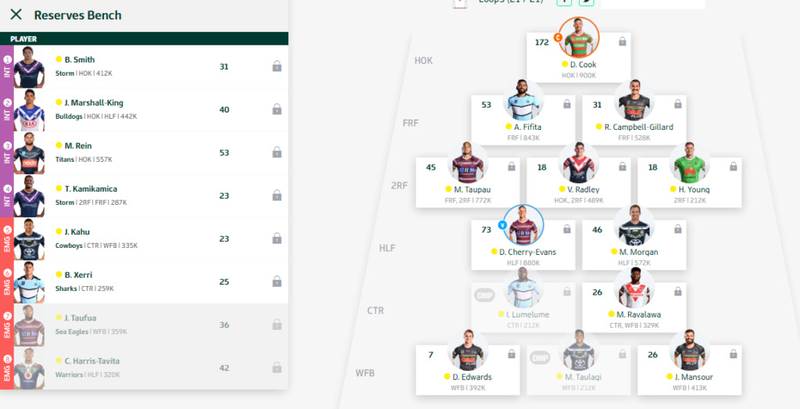 Here you get to see Capewell and Tolman play, if you like either score you can take it. For Tolman's score you switch Bateman with Garner, or leave as is for Capewell's score. If they both bomb and you think Rava can score better, you can switch CHT and Rava to get his score instead. 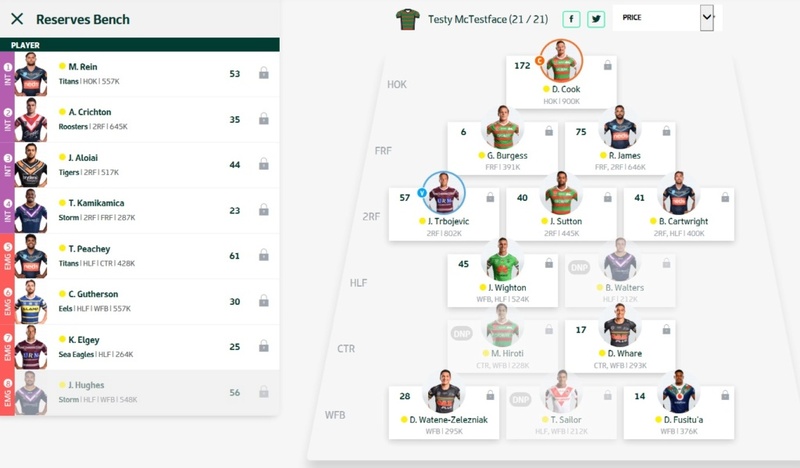 Mattnz has come up with some great options, but note that you can't captain or VC any of the players you might want to move around.